The Ukrainian Greek Catholic Church is one of twenty-four particular churches that together, through their shared communion with the Bishop of Rome (the Pope), constitute the Catholic Church. The roots of the Ukrainian Church date back to AD 988 in what is present-day Kyiv in Ukraine, when the Grand Prince Saint Volodomyr chose the Eastern rite of Constantinople for his people. After considering many different religions, Saint Volodomyr judged the worhsip of the Greek Christians the closest thing to being in Heaven. Our Church came to Canada in the late 1800’s from Ukraine, but our rich faith in God is for everyone! In Canada, we have become a multi-ethnic and multi-cultural community of believers. You no more need to be Ukrainian to worship with us than you need to be Italian to worship in a Roman Catholic parish. If you are Catholic, your Sunday obligation is fulfilled by attending the Divine Liturgy in our Church. We hope that you will feel at home praying with us. If you are new to the Ukrainian Catholic liturgy sit next to one our friendly parishioners, who will be happy to guide you through the service. The Ukrainian-Greek Catholic Church is one of several Byzantine* rite churches, which are descended from the traditions and customs of Constantinople rather than Rome. Over time, our Church has added to that ancient heritage distinctly Ukrainian traditions and music, while always preserving the richness and reverence of what we have received. * The word ‘Byzantine’ comes from the city of Byzantium, the old name for the city of Constantinople (now Istanbul). The term is used in the same way the name ‘Roman’ is used of the Western (Latin) Church. Ukrainian immigrants began to arrive in Nanaimo in the early 1900s, in the years before the First World War. Many attended the local Roman Catholic church, but longed for their own priests and traditions. It would be many years before that dream became a reality. In the Spring of 1981, Rev. Deacon Paul Stephaniuk arrived in Nanaimo with his wife, Zena. Deacon Paul had been granted permission by the first Bishop of the Eparchy of New Westminster, the Most Rev. Jerome Chimy, to establish a chapel in his home, where Bishop Chimy celebrated the first Divine Liturgy in June of that year. Three years later, the Eparchy of New Westminster, together with Deacon Paul and parishioners, purchased and renovated the old Wellington United Church on Victoria Avenue. Under the patronage of St Michael the Archangel, the new Ukrainian Catholic church was officially opened and blessed by Bishop Chimy on 9 June 1984. 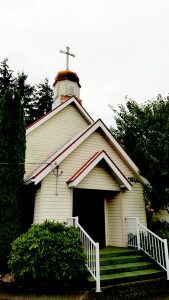 In the years since, St Michael the Archangel parish has fulfilled in Nanaimo the dream of those original Ukrainian immigrants, as well as providing a spiritual home for new immigrants and visitors, Canadians of Ukrainian descent, and those attracted to the liturgical traditions and spirituality of Eastern Christianity. Our community is small but vibrant. The celebration of Divine Liturgy is the centre of our parish life, around which revolve social and cultural events, community meals, the parish council, seasonal fairs and fundraisers, and local activities of the Ukrainian Catholic Women's League. The Ukrainian Catholic Eparchy (diocese) of New Westminster was established by the Apostolic See of Rome on 24 June 1974. Formerly part of the Edmonton Eparchy, the territory administered by the Eparchy now comprises all of British Columbia, the Yukon Territory, and that part of the Northwest Territories west of the 120th longitude. The first bishop appointed to the new Eparchy was the Most Rev. Jerome Chimy OSBM, who was ordained to the episcopate on 5 September 1974 at Protection of the Blessed Virgin Mary parish in Vancouver. The following day he was enthroned at Holy Eucharist parish in New Westminster, which he named as his cathedral. Our present Eparch, Bishop Ken Nowakowski, is the third Eparch of New Westminster. He was consecrated a bishop on 24 July 2007.